This has always been a crowd pleaser. We started with this recipe at allrecipes and made it our own. Mix the 2 packages of pudding into the tub of Cool Whip adding whole milk in small amounts to make it easier to stir the cool whip mixture without letting it get thin. You want the mixture thick (spreadable not pourable) but not so thick you break a spoon trying to mix it. 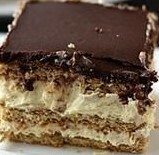 Fridge cake at least 4 hours before serving, but can be kept for a few days if well covered. Store in fridge and enjoy!